Certification Levels | Special Touch Ministry, Inc.
Each church takes a survey to determine the current Disability Friendly Certification operating level. Upon completion, participants are certified at one of four levels: Bronze, Silver, Gold, or Platinum. Bronze Level – This is the basic level of Disability Friendly Certification. Churches receiving this level of certification have shown their desire to welcome people with disabilities. Many churches begin at this level of Disability Friendly Certification, but tend to quickly move up to higher levels. Some amenities a Bronze Level certified church may have include: accessible ramps to front entryway and wheelchair-accessible parking. Silver Level – This is an improving level of Disability Friendly Certification. Churches receiving this level of certification have shown that they have taken the time to provide additional services to integrate people impacted by disability into church programs beyond the meeting of basic accessibility needs. Some amenities a Silver Level certified church may have include: Braille materials, in-home supports, programming friendly to specific intellectual disabilities, and/or opportunities for people with disabilities to serve. Gold Level – This level is the second highest in Disability Friendly Certification. Churches receiving this level of certification clearly show a desire to include and welcome people impacted by disability in all areas of their church programming. Amenities a Gold Level certified church may have include: Those in both Silver and Gold levels with the addition of others such as, a family-style restroom, buddy-system, supports for those with hearing and visual impairments, staff trained in disability ministry, and welcoming to service animals. 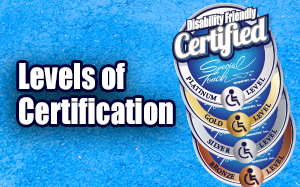 Platinum Level – This level is the highest in Disability Friendly Certification. Churches receiving this level of certification have gone above and beyond. They have demonstrated that their church is dedicated to removing every barrier to people with disabilities and has become a place where every person can find programming and services to meet their unique needs. Churches at the Platinum Level have numerous amenities found in all other levels which may be overseen by a disability ministry pastor on staff. Survey questions are also divided into four categories. Based on their answers, churches can receive up to four Dove ratings in each category. 1. Building and Grounds: Whether or not a church is Disability Friendly starts in the parking lot and at the front door. Building accessibility is the first sign of Disability Friendliness. Obviously, the easier a wheelchair user can navigate the building and grounds, the better. However, many churches make a mistake thinking that if their building has few architectural barriers to mobility they are qualified as being Disability Friendly. Nothing could be further from the truth! 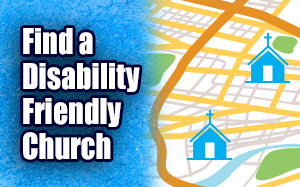 A church building could be perfect in every way for wheelchair users, yet there could be many other things about that church that scream to people with disabilities, “You’re not welcome here!” Therefore, Building and Grounds is only one portion of this assessment. This survey is designed to help churches move successfully through each level to achieve the next. There are not very many questions in this category, but each one is extremely important. Though families may look for specific amenities to meet their needs, a higher dove rating in this level shows that the church provides more unique opportunities for personal Christian growth. 3. Supports: Along with spiritual growth perspectives, in every disability friendly church, comes the need for valuable facilitation and full life integration of people with disabilities into the family of believers. “Stepping in the gap” for other members is what makes a real church a “family.” To know that fellow believers “have your back” in specific areas of need, breeds “equal concern for each other,” demonstrating the truth of 1 Corinthians 12:25. According to Galatians 6:2, we fulfill the law, when we bear one another’s burdens. Providing various “supports” perfects the art of burden bearing and brings a higher level of Disability Friendliness! 4. Spirit of Accommodation: People with disabilities face many barriers but the most hurtful are attitudinal, how they are perceived by others. Christian psychologist, Dr. Lawrence Crabb, states, “Every individual’s most basic need is to consider himself a worthwhile human being.” As a living organism, every church body develops various aspects of personality and, to a degree, its own unique culture. What is the overall personality, or culture, of this church regarding consideration, acceptance, inclusion and friendship building of others who may be different than the mainstream within the congregation? Would the “body language” of this church make every person with a disability feel like they are “worthwhile?” This is where the “Spirit of Accommodation” rises or falls. A true “Spirit of Accommodation” is best illustrated by 1 Corinthians 12:22, “…those parts of the body that seem to be weaker are indispensable, and the parts that we think are less honorable we treat with special honor. The “Spirit of Accommodation” says, “We will faithfully step in the gap for our disabled constituents and we will “clothe” them with dignity at all times!” This category is perhaps the most important in the survey, because a true “Spirit of Accommodation” can take your church to the highest levels of ministry success! For further questions and clarifications on the levels and Dove Rating Categories outline above, please contact the Special Touch Ministry National Office. Find the number of people with disabilities in your location.